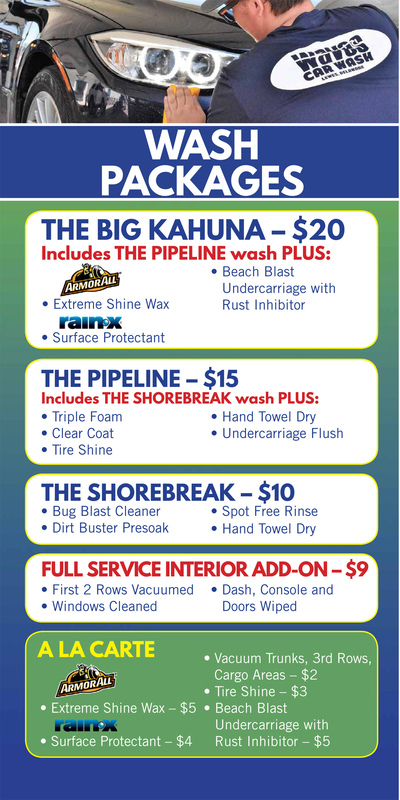 GET READY FOR A WHOLE NEW CAR WASHING EXPERIENCE… THE “FLEX-SERVE” WASH! AS SUSSEX COUNTY’S ONLY FLEX SERVE WASH, WE OFFER CUSTOMERS MORE “FLEX”ABILITY THAN A TRADITIONAL FULL SERVICE WASH.
MAKING SURE TO HELP FIT YOUR VEHICLE’S NEEDS AND YOUR BUDGET! OUR LOADERS WILL GUIDE YOUR CAR ONTO THE CONVEYOR WHERE YOU REMAIN INSIDE THE VEHICLE AS IT TRAVELS THROUGH THE TUNNEL (YES WE CAN DRIVE IT THROUGH FOR YOU IF YOU LIKE:) REMEMBER – CAR IN NEUTRAL, NO BRAKES, NO STEERING, NO WIPERS, AND ENJOY THE RIDE! UPON EXITING THE TUNNEL, IF YOU HAVE PAID TO HAVE THE INSIDE OF YOUR VEHICLE CLEANED, SIMPLY PULL UNDER OUR DETAIL CANOPY AND EXIT INTO OUR LOBBY TO ENJOY COMPLEMENTARY COFFEE WHILE CHECKING OUT OUR GREAT SELECTION OF AIR FRESHENERS, GREETING CARDS AND THE FAMOUS BEACHTOWN BAGS COLLECTION! IF YOU HAVE OPTED FOR AN EXTERIOR-ONLY WASH, CUSTOMERS SIMPLY REMAIN IN THE VEHICLE WHILE OUR TEAM TOWEL DRIES AND APPLIES TIRE SHINE. THIS WAY, EXTERIOR-ONLY WASH CUSTOMERS ARE IN AND OUT IN A MATTER OF MINUTES AND NEVER LEAVE THE CONVENIENCE OF YOUR CAR! 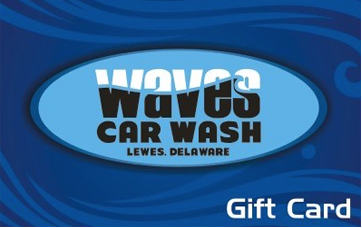 GIFT CARDS AND WASH BOOKS ARE ON SALE NOW! 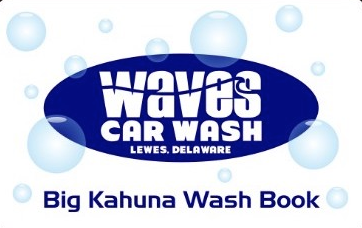 BUY ANY 5 WASHES AND GET 2 FREE WITH OUR WAVES CAR WASH WASHBOOKS!